It is a great way to keep your stuff backed up without thinking about it. Most SATA controllers have RAID these days so you just install another drive about the same as the one you want backed up and it "mirrors" the original all the time. Drives are cheap enough that this is not really that expensive. If a drive fails you get a message, swap out the bad drive and the system re-syncs to the new drive. Nothing is lost. You can run single while you are getting your new drive but be aware you are not protected. I am. Two family members and some friends lost their hard drives in the last few months. They lost pics, documents, and just general everyday stuff. I bought a 500gig external backup HD for about $80 at Best Buy. I plugged it in and it did all the work. When I change a file, it changes its files. It is cheap insurance and protection for my company and family files. That is not exactly the same as RAID 1 mirroring but it accomplishes the same thing. I back up my company's books on a usb memory stick.The external back-up drive would give better protection for all my files.Thanks for the good idea. Prior to this Machine, all others were IDE type Drives. Mirroring would require a Drive Controller on the Expansion Bus, along with SCSI Drives - which the costs were > 300% of a "Master / Slave" set of Two IDE Drives. This was a very Jurassic approach! (manually updating data from the "Master" Drive to the "Slave" Drive), but it did keep a redundant copy of my data + Directories, so when the Drive with the MBRs did fail, data was still arranged per Sub Directory structure. This dramatically reduced the time and tasks required to get the Machine back in operation, but had more risks than a fully functioning RAID (Redundant Array of Inexpensive Disks / Drives). 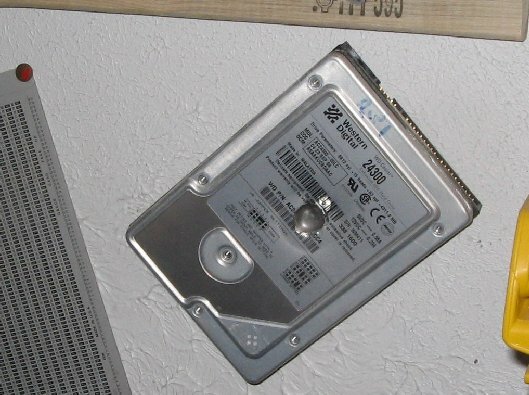 The Motherboard on this Machine has (6) SATA Drive Controllers built in, and was shipped with a single SATA Fixed Disk ("Hard Drive"), and a SATA CD-RW/DVD-RW+/-. About 1 year after receiving the Machine, I decided to initiate a RAID Approach - and to do so with a "Clean Slate". So I backed up all data + Directory Structures to DVD-Rs, then performed an Unconditional Format on the original Fixed Disk Drive. The Original Drive on Controller SATA0 was a Western Digital "Caviar" Series, 320GB SATA. So I purchased an exactly similar Drive from Fry's, for use on SATA1. (how many know the story here already???!!!). About 1 Month later, Original Drive dies, so it gets removed, and the machine gets setup to use a single Fixed Disk. Shortly there after, the other drive commits suicide! That was when I discovered the issues with the WD 320GB Caviar Series SATA Drives. Current configuration uses (2) Seagate "Barracuda" Series 500GB SATA Drives. W/D has by far the highest representation in my pile of bad drives. It is something like 6 to one over the Maxtor and Quantums. Yup I was a little mad at that one. I'd be very careful storing anything mission critical on a USB flash drive. I have heard of these things dying after the static from peoples clothing (with having the drive in their pocket) has killed the drive. Maybe it's just a freak thing, but it's not the sort of risk I'd like to take with important data. I have had thumb drives suddenly die on me. No complaints about my thumbs, at least 12-15 assorted mfg's & capacities. After reading through this thread, I'm seeing how computer un-savvy I really am! My backups are on a WD 'My Book' which I manually 'copy' to, as the auto backup that came with it took forever & slowed this LT down big time. Critical data is either on a CD or a dedicated thumb, and secondarily on the WD My Book. That's what I like about ECN, ya never stop learning! I have been fairly lucky over the years, in terms of drive failures. The most recent was just over a month ago, with a Seagate in my Mac Mini; I'm assuming that was a heat-related failure since things are packed pretty tightly in there. The time before that, it was another Seagate almost 10 years ago. I agree that Quantum and Maxtor were both good brands, but unfortunately they're both part of Seagate now. I have some Quantum drives that are over 20 years old and still kicking. I don't do any RAID currently; my important files are backed up across three different computers using Live Sync, and also on an external 1TB drive using Time Machine on the Mini. That, and the occasional optical backup (usually every three months--much less frequent than I used to do) and I think I'm pretty much covered. The only down-time I experienced with the recent drive failure was waiting for the replacement to arrive and installing software. Of course, this happened between the time the external was ordered, and when it showed up--if I'd already had the external in place, restoration would have taken a couple of clicks. While RAID is great for enterprise servers where downtime costs big $$$, I don't see it as necessary for the average user. Of course, my perspective may be a little different since I have multiple computers and having one go down doesn't bring everything to a halt.